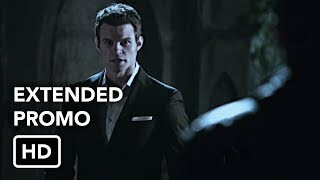 The Originals 1×03 “Tangled Up in Blue” – After discovering interesting news about someone in Marcel’s (Charles Michael Davis) inner circle, Klaus (Joseph Morgan) and Rebekah (Claire Holt) come together to attempt to unravel Marcel’s empire from within in spite of Elijah’s (Daniel Gillies) concerns. They enlist help from Sophie (Daniella Pineda), who is reluctant to get involved for fear of the wrath of Marcel’s secret weapon, Davina (Danielle Campbell). Rebekah sneakily invites an oblivious Cami (Leah Pipes) to a huge vampire party thrown by Marcel, managing to anger Marcel in the process. Elsewhere, Hayley (Phoebe Tonkin) learns from the witch Sabine (guest star Shannon Kane) that the supernatural creatures of New Orleans are reacting to the potential existence of a hybrid baby. Chris Grismer directed the episode written by Ashley Lyle and Bart Nickerson (#103).